This is probably a record for me. I think I made this card in approx. thirty minutes! I had to do up a wedding card fast. 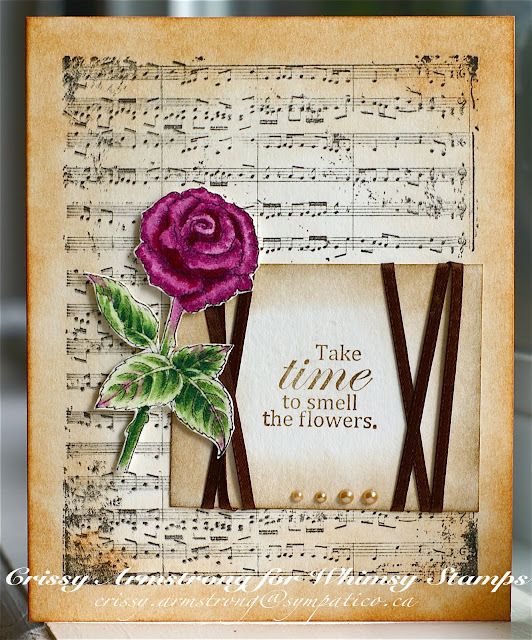 I used the stemmed rose from my Fragrant Rose set I did for Whimsy awhile back. I also used one of the sayings that Ann designed that comes in the set. The gorgeous music background is also designed by Ann and it is called Music Notes. Hey here's a head's up! Ann is doing a daily giveaway for the month of May to celebrate her 2nd blogversary! There's still time to pay her a visit and get in on it before May runs out of days! I ink distressed all the edges using Vintage Photo ink and Stained Walnut by Tim Holtz. I love those inks! The rose was coloured using Copics. I cut it out and popped it up with foam tape. I think this is the first time in a year or more that I made a card without a) Spellbinder dies or b) designer paper! It isn't my usual style, but I like how it turned out! There is also still time to get in on my challenge over at Sundays With Crissy! This month the challenge is easy - Flowers! Go see what my DT has prepared to inspire you! I am sharing another painting today that I did for a good friend. 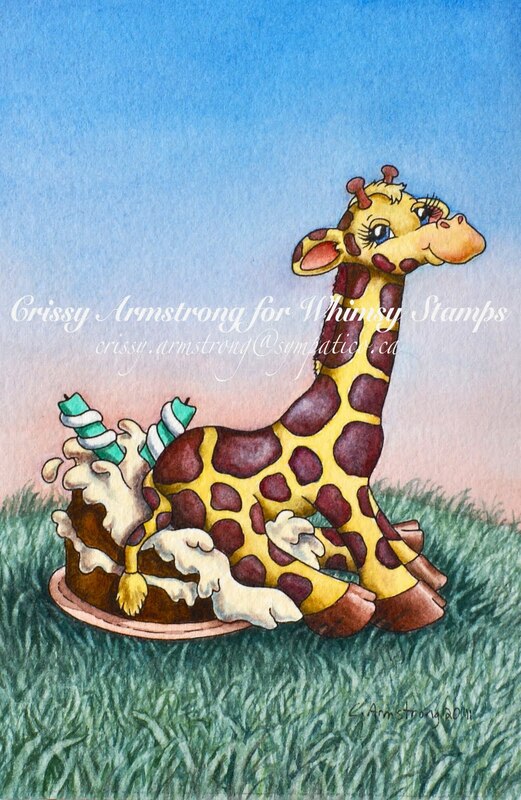 I used the image I did for Whimsy called, "Big Comfy Cake". The image is on water colour paper and then painted with my artist quality paints. I really love to water colour as much as I love to use Copics! If I had to decide between the two I don't think I could. Both mediums are so fun, yet sooo vastly different to work with. While the watercolours blend themselves practically, the Copics take a lot of getting used to at first to get a good blend. And I don't think I could do the sky as I did here using Copics. Maybe some super skilled Copic user could. But the soft and seamless blend of pink to blue would be really hard to obtain using Copic markers. I had a lot of fun doing the grass. It was actually quite challenging but in the end I think I pulled it off ok. I'm still no expert water colourist, that is for sure, but every time I paint I get a little bit better than before. 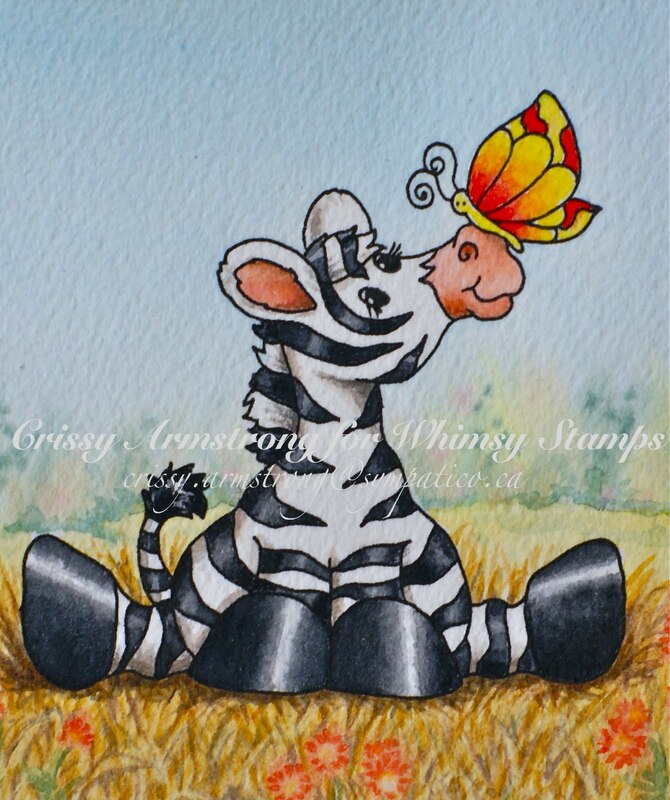 I will leave you with pictures of my latest rubber release from Whimsy Stamps. Love is not something to accomplish, and thus, it is not something at which we succeed or not succeed at. Love is not something God gives us directions and guidelines for so that we can go out and “do it”. Just by being who He is (love) God, aka Jesus, showed us what love looks like. But it is not something we can accomplish or do. When we look at Jesus and how He lived and what He did, we can recognize love when we see it. Jesus provided a stark contrast between what Love truly is and what the world called “love”, which was actually hatred by comparison. The only way we love as He loves is to let and allow His love to flow through us. And the only way we let and allow His love to flow through us is by believing and receiving Jesus, His Love, on every level in our hearts. We love because He first loved us. That is the key to it. Behold He stands at the door (to our hearts) and knocks. We become like Him when we let Him in to our hearts. When we let Him in, He shows us who He is and who we really are. And when we know who He is and who we are on every level, we can let His love flow out from us on every level. Until we know, have a deep unmovable revelation and conviction of His love for us in the deepest places of our hearts, we are crippled by ungodly thoughts about ourselves, and about Him and about others, and in this crippled state, we cannot truly love as He does. But oh, what bliss, when we let and allow Him in, and let that conviction of His love take root (rooted and grounded in love). For then we witness, just like with Jesus, His love flowing in and through us and out to others. It is truly a beautiful thing. Learning to let Him in and to be all that He says we are is a process that takes time. We get to see glimpses of it as we learn and grow up into Him. And as we mature, these glimpses become a part of the flow of our lives, and become more than mere glimpses, but a way of life. It is not about doing though, it is about being – being in Love with God, being with Him in every moment, being Who HE created us to be, and truly knowing what that is. The “doing” of the righteous acts of the saints comes naturally out of such a state of heart and mind. It becomes “natural” to love rather than to hate, fear, or otherwise act unrighteously. And then we can say, it is not something we accomplished, or did. It is Someone we ALLOWED to flow in and through us. It is Jesus loving through us. It is that one-ness and unity with Him that manifests true love. Love is not possible without Him, for there is no love apart from God. There is no set of instructions or rules to follow whereby we can say we have followed them, and thus we have loved. For love is a Person. Love is Jesus. Jesus is God. And God is Love. I wish to spend my life in Love with God, allowing Him to love me fully, and allowing His love to flow outward from me to others. This is my passion in life: my God who is Love. There is nothing and no one worth giving my life to other than to Him. He is beautiful beyond description. And He is everything that you, dear Reader, have ever longed and wished for. We all long to be loved passionately and fully and to be accepted and cherished for who we are. I am here to proclaim to you today that this IS what you have in Jesus who is the God of all. He loves you that much. He wants you to know Him and His love for you. It is personal and it is real. But it is up to you to let Him in, to let His love in. Won't you give it a thought today. Give Love a chance. He is longing that you would! God bless you and thank you for reading! PS Ann Vento of Raindrop Echo Designs graciously has put some of my love sayings into digi stamp format. If you want to see the set she so beautifully created, go HERE. Bless you! There's a new release going on at Whimsy starting tomorrow at 10:00 A.M., and at 12 noon, there's a blog hop going on to showcase all the new images and dies! I'm giving you a head's up, but I won't be involved in it this time. You'll want to check it out tomorrow! So at noon tomorrow, you can start the hop at Lori's blog HERE. This is Whimsy's largest release ever! You won't want to miss it!! 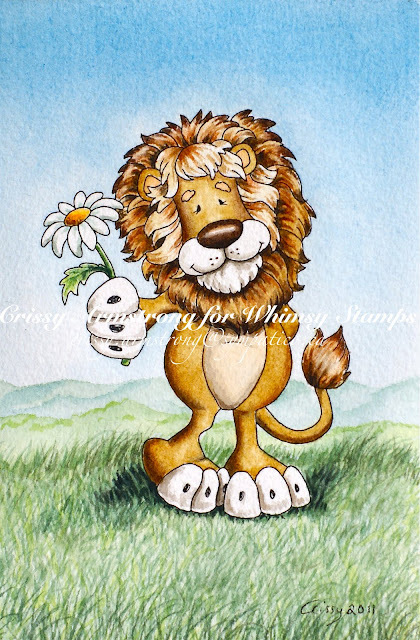 Today I am showing another water coloured image that is part of a series I am doing for my friend. 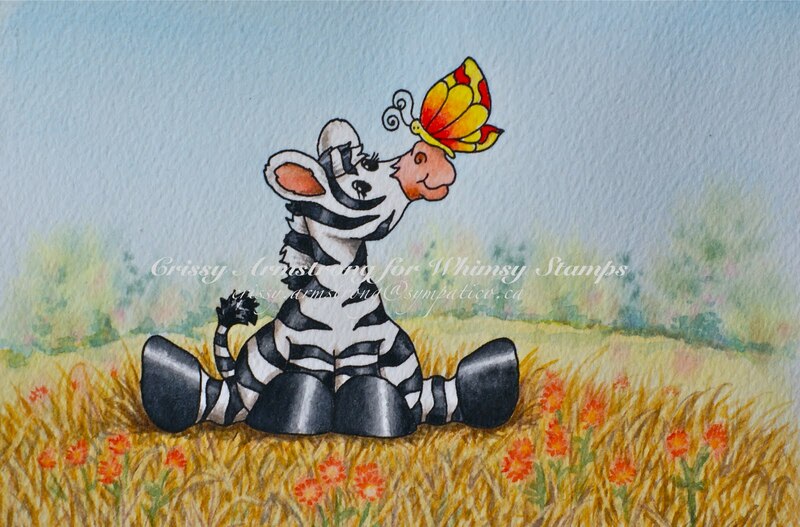 This is an image I did for Kraftin Kimmie Stamps called Stripes the Zebra. Stripes is on 140 lb. wc paper and painted with artist quality water colour paints. The challenge this month over at my Sundays With Crissy challenge blog is flowers. I thought Stripes would look good with a few wildflowers around him, so I tried to give the impression of Devil's Paintbrush wildflowers among some yellow grass. I hope you will be able to join in the challenge this month. It's easy - just have at least one flower included in your project. It can be a flower embellishment, a flower in the image, flowery designer paper, a flower charm, hand drawn or painted, whatever way you wish to add a flower or three or ten, it's up to you! There's a blog hop on and you have landed near the tail end of it. If you have come here from Ellie's blog, you are right on track! If you happen to get lost along the way, the entire blog hop rotation is posted at the Whimsy Inspirations Blog for your added convenience. This hop will be running from Sun May 1 thru Sun May 8 at noon. There will be 2 free digi's given to two random commenters, so increase your chances of winning by commenting on all the blogs in the hop! The grand prize winner will get to choose 5 digi's of their choice, AND will get a chance to use those digi's as a guest designer for Whimsy for the entire month of May! How cool is that! And just to let you know, the digi images that Whimsy is selling to help raise funds for Japan are going on sale at 50% off from May 1 thru 7! Here is a direct link to the Help For Japan images. 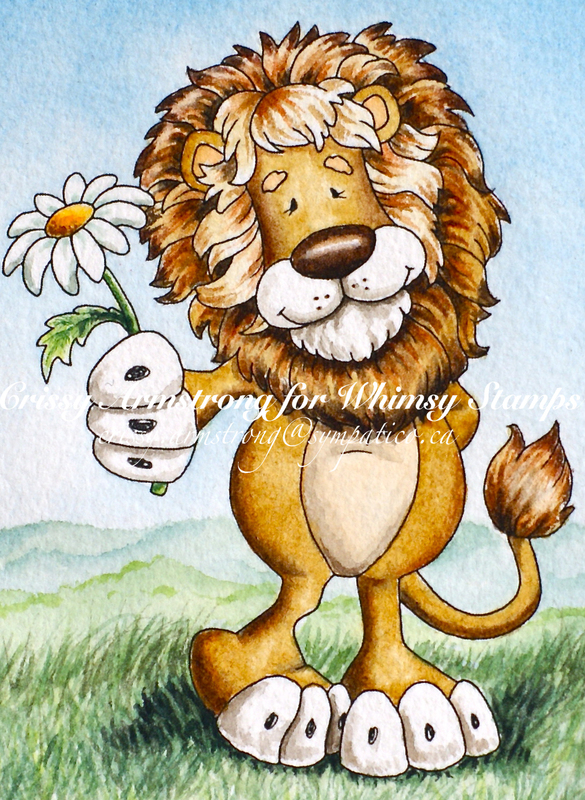 I'm showcasing one of my latest digi illustrations: Courageous Carl. He is available now for purchase from Whimsy Stamps. I printed Carl onto high quality water colour paper - Arches 140 lb cold press. I used a laser jet printer and had to heat set because of the thickness of the paper. But once I was done, he was ready to paint! I got out my artist quality water colours for this one. I love water colouring as much as I love Copic colouring! This is actually a commissioned piece I am doing for a friend, who intends to frame it and put it in her brand new nephew's room. It was fun to make a mini water colour painting based on my illustration. I am also entering this digi stamp painting into my own challenge. The challenge for the month of May is "Flowers". Here is a quick link to my challenge blog so you can read up on all those details, and join in if you can! Why not head on over to Tina's blog to see what's next!